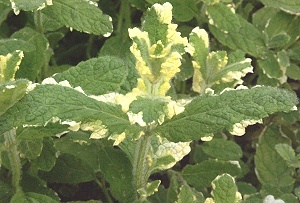 Pineapple Mint is hardy to zone 6, and likes full sun in all but the hottest areas where afternoon shade is preferable. Make yourself a tea barrel and use Pineapple Mint often. It is important to keep any rogue green stems cut off. If left to grow these totally green leaved stems will outgrow the variegated ones and you will loose the variegation. The result will still be tasty but it will be Apple Mint instead of Pineapple Mint! On the flip side of all green leaves are the stems with leaves that are totally devoid of color. These segments are doomed to death because without some green they are unable to make food. They also sunburn easily which can also hasten their demise. Fortunately, these albino stems occur infrequently. 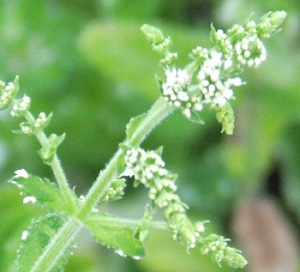 Pineapple Mint makes a great addition to our Tea Herb Garden Six Packs. A container with a large surface area helps mint to grow abundantly. 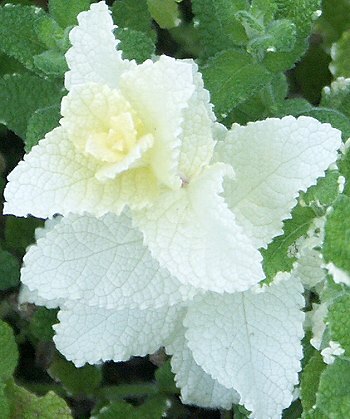 Mints grown in five to six hours of sun develop better color and flavor. In hot summer areas, late afternoon shade helps to cut down on the watering chores. They are hardy to zone 5 and will die back to the ground in winter. 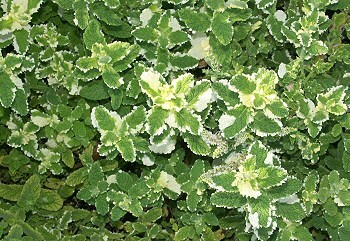 Cut Pineapple Mint to the ground in late fall and it will be fresh and crisp in spring. It may need to be divided in the spring. When the mint stops producing heavily, it is time to thin out the roots. This plant is often available in plug trays. These trays hold 128 of all the same plant. They are a great low cost way to fill a lot of space. Each cell is 3/4 of inch by an inch. Check here to see if Pineapple Mint Plug Trays are available.